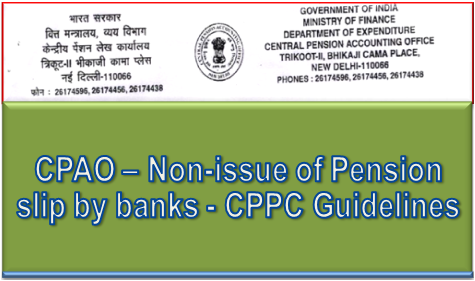 Subject:-Non-issue of Pension slip by banks. 1. Heads of CPPCs of all Banks. 2. Heads of Government Business Divisions of all Banks (As per list). The Home Branch will act as intermediary between the pensioner & CPPC and, besides providing accounts statement, provide to the pensioners the TDS, pension slip, the Due and Drawn Statement in respect of each arrear and the Annual Income Statement”.